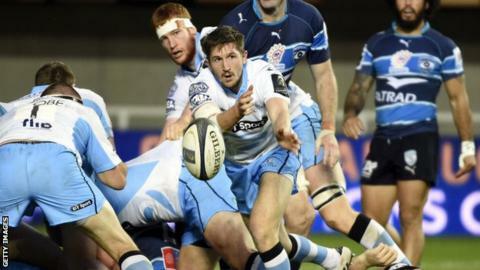 Glasgow Warriors remain top of European Rugby Champions Cup Pool Four after beating Montpellier at the Altrad Stadium. Finn Russell kicked three penalties to Benoit Paillaugue's two to give Glasgow a narrow half-time advantage. Russell kicked two more before the hosts got a late converted penalty try. However, Glasgow and indeed Scotland were dealt a major blow when Tommy Seymour suffered a head injury. Also in Pool Four, Toulouse beat Bath 21-19 at the Rec, meaning Glasgow lead Toulouse by a point after two rounds of fixtures. Gregor Townsend's men, buoyed by last week's opening group win against Bath, took an early lead through Russell's penalty but their next kick, by Stuart Hogg from near halfway, hit the outside of the left-hand post. However, the French Top 14 side continued to infringe and Russell kicked the Warriors into a six-point lead. Paillaugue's first penalty for the hosts was successful but Russell soon replied. Paillaugue, with his next kick, followed Hogg in hitting the upright. After several Scots were injured in Edinburgh's 25-17 Challenge Cup win over Lyon on Friday, there was further concern for national coach Vern Cotter when Seymour was stretchered off in a neck brace. The winger came into collision with Sitaleki Timani and was treated by medics for several minutes before leaving the field. DTH van der Merwe replaced Seymour and the Warriors almost claimed the opening try when Mark Bennett was stopped just short of the line. Paillaugue brought the home side back to within three points but dragged his first penalty of the second half wide. A superb break by Bennett eventually led to the sin-binning of Montpellier's Robert Ebersohn and Russell successfully kicked the resulting penalty. Hogg could not find the posts with his latest long-range penalty but a knock-on afforded Russell the chance to extend Glasgow's lead and he duly delivered. Enzo Selponi's drop-goal attempt bounced under the posts and there was more frustration for the home fans when Paillaugue's replacement Teddy Iribaren shanked his first penalty wide. Another miss from distance by Hogg preceded Montpellier's penalty try, which came after several scrums, and Iribaren added the extras. The two-point margin of defeat ensured a losing bonus point for the home side. Montpellier: Benjamin Fall, Timoci Nagusa, Rene Ranger, Robert Ebersohn, Viriviri Nasagavesi, Enzo Selponi, Benoit Paillaugue; Yvan Watremez, Mickael Ivaldi, Chris King, Tom Donnelly, Sitaleki Timani, Kelian Galletier, Akapusi Qera, Alex Tulou (capt). Replacements: Thomas Bianchin, Mikheil Nariashvili, Nicolas Mas, Thibaut Privat, Alexandre Bias, Teddy Iribaren, Wynand Olivier, Pierre Berard. Glasgow Warriors: Stuart Hogg, Sean Maitland, Mark Bennett, Alex Dunbar, Tommy Seymour, Finn Russell, Henry Pyrgos; Gordon Reid, Pat MacArthur, Ewan Murray, Tim Swinson, Jonny Gray, Rob Harley, Chris Fusaro, Josh Strauss (capt). Replacements: Fraser Brown, Alex Allan, Rossouw de Klerk, Leone Nakarawa, Adam Ashe, Niko Matawalu, Duncan Weir, DTH van der Merwe.